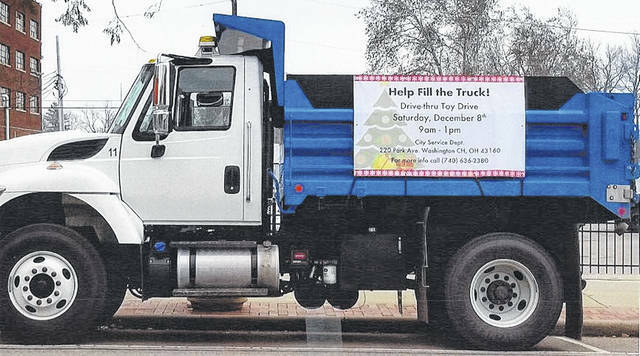 This truck will be parked at the city service department on Dec. 8 for the city’s first drive-thru toy drive. The City of Washington Court House is holding a drive-thru toy drive on Saturday, Dec. 8 from 9 a.m. to 1 p.m.
City employees are asking the community to help fill the large truck that will be parked at the service department, located at 220 Park Ave. The toys will be distributed to families who are in need this Christmas season. This is the first drive-thru toy drive the city has organized. Toys will be distributed at a later date. For more information, call 740-636-2380.
https://www.recordherald.com/wp-content/uploads/sites/27/2018/11/web1_ToyDriveTruck.jpgThis truck will be parked at the city service department on Dec. 8 for the city’s first drive-thru toy drive.